The Yamaha DT is a series of motorcycles and mopeds produced by the Yamaha Motor Corporation. Models in the DT series feature an engine displacement of 50 to 400 cc (3.1 to 24.4 cu in). The first DT model, the DT-1, was released in 1968 and quickly sold through its initial 12,000 production run. 1968 Yamaha DT-1 in Yamaha Communication Plaza. The DT series was created by Yamaha in the late 1960s when the United States motorcycle market was down. Market research by Yamaha indicated that, despite slow motorcycle sales, there was a largely untapped market for off-road motorcycles. At the time, only a few specialty European manufacturers such as Bultaco and Husqvarna made motorcycles specifically for off-road use. Instead, many owners purchased road motorcycles and modified them for off-road use, typically by raising the muffler, adding braced handlebars, and fitting a bash plate under the engine . Such modifications were commonly known as creating scramblers. The first DT model, the DT-1 trail bike, was released in 1968 and quickly sold out. With the introduction of the DT-1, Yamaha essentially defined a new market for motorcycles. A Dual-sport motorcycle built for off-road riding, the light and slim DT-1 was equipped with block-pattern tires and had sufficient ground clearance. Its design put it at the cutting edge of off-road bikes at that time. It had a 250 cc, single-cylinder, 5-port engine based on a motocross design, and Ceriani-type front suspension. 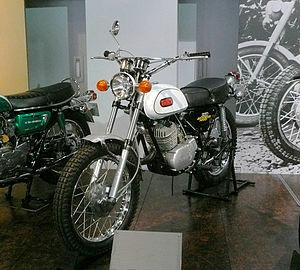 The Society of Automotive Engineers of Japan (in Japanese), included the 1968 Yamaha Trail 250 (aka DT-1) as one of their 240 Landmarks of Japanese Automotive Technology. ^ a b c d e f g h i j k l m n o p q "Yamaha Trail 250". 240 Landmarks of the Japanese Automotive Industry. Society of Automotive Engineers of Japan, Inc. Retrieved 10 August 2013. Yamaha's first no-compromize [sic] off-road model. ^ a b Sean Ross (May–June 2008). "Yamaha DT-1". Motorcycle Classics. Retrieved 2009-08-07. ^ a b c "Paving the Road to Yamaha Motor Corporation, USA". Yamaha Founding History. Yamaha Motor Corporation, U.S.A. Retrieved 10 August 2013. The world's first true off-road motorcycle debuted in 1968 to create an entirely new genre we know today as trail bikes. ^ a b Salvadori, Clement (February 2010). "Retrospective: Yamaha DT400 Enduro: 1975 - 1979". Rider Magazine. Retrieved 11 August 2013. The DT1 was a superb motorcycle right off the drawing board, as its two-stroke, piston-port single with five ports provided the good lowend grunt that play-bikers wanted. ^ Motorcycle Classics, "1968 Yamaha DT-1."